Yesterday before the meeting, we went to eat at Kim Chee 7, which is my favorite place to eat Korean food. They have really great kim chee here, especially the daikon pickles, which are pictured below on the left. On the right is their regular kim chee, which I didn’t like before, but now love. In the two little bowls are their onolicious meat jun sauce. SO GOOD! 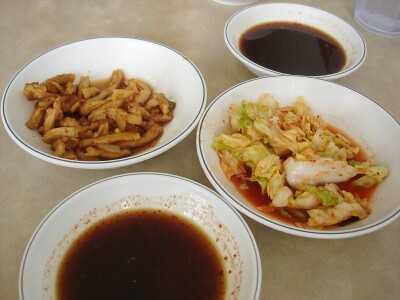 I had the lunch special, which is a combination plate of meat jun, bbq chicken, mandoo, and vegetables. I don’t really care for their plate veggies all that much, it’s really the only weak part of Kim Chee restaurants. If you want the best bean sprouts namul, potato, cabbage, and taegu you have to go to Gina’s. Usually I dump the cabbage into the kim chee sauce in a little attempt to make myself more of that yummy stuff. Before the people who pay attention to my dieting completely flip out, I did not eat all of this. I ate all the meat jun and a small part of one chicken. The rest will no doubt show up in a bento tomorrow. I ate very little rice, so it wasn’t too bad. 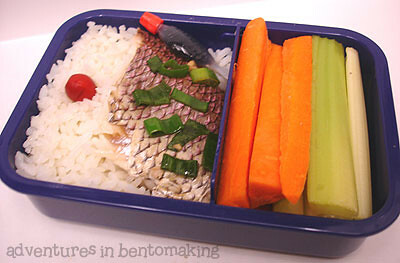 Work parties and meetings are proving to be a constant interruption to my bentos! 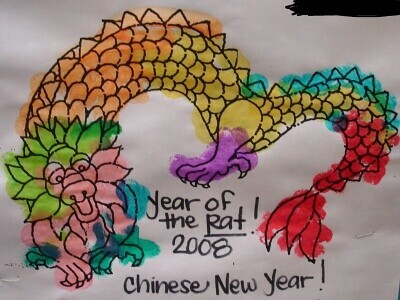 lol Today is Chinese New Year and so we had a team meeting + potluck. I bought some pork hash from Chun Wah Kam this morning. As you can see, I was pretty good, even though it was a lot of food. 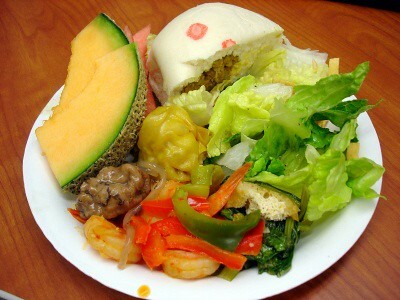 I took from both salads, the shrimp dish, half a manapua, choy sum, and fruits. I hope no one is getting annoyed that I’m posting regular food here now. 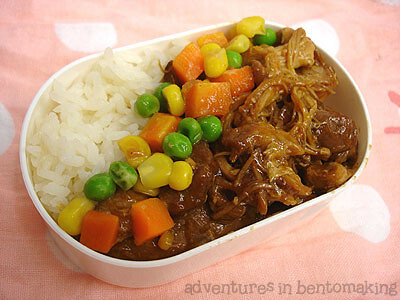 I just figure that bentos aside, the food we eat here in Hawaii can be just as interesting. I bet I make my ex-Hawaii mainland dwellers drool too, haha! By the way, the teacher gave an exceptionally glowing review of my darling spawn, leading me to the conclusion that I am the proud mother of the Teacher’s Pet. It was a combination of the “she defends the littler kids from bullies” and “she’s like a leader in the class” comments, the fact that she gets to sleep next to the teacher’s desk, and the story she told us on the way home about how the other kids go out to play and she stays in class with her best friend and they eat gummy bears (A whole package, Mommy!!) with the teacher. Nice. I’m going to have a lot of explaining to do when she watches The Secret of Nimh for the first time!! Sorry for the late posting, I’ve hit 9,999 posts on Allakhazam and I’ve been busy prepping what I’m revealing for my 10k ding. Today I had a three tier bento but don’t let the pictures deceive you, this box is actually really small, maybe 5 inches long or less. It was a plain box that I got at Marukai this summer during E3 and I added a sticker to make it a little cuter. This is shoyu chicken made by my MIL with some white rice decorated with mixed veggies. 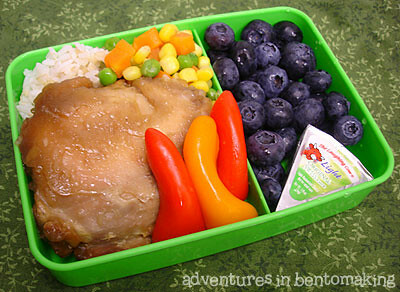 If you’re thinking to yourself, “Geez I wonder if she placed those vegetables into her bento one by one”, the answer is yes I did. I used chopsticks. In Allakhazam IRC yesterday we were all laughing at this guy who doesn’t know how to use chopsticks. All in good fun, but I just wanted to mention how awesome chopsticks are. I even eat spaghetti with chopsticks; a habit I picked up from my friend Janis. 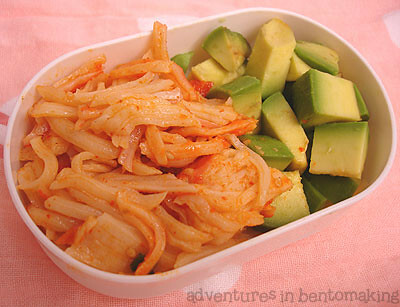 I packed more kim chee crab and avocado without lettuce. I found after forgetting the veggies that it’s actually not too bad without it, especially if I don’t have room in the box. I bought the avocado at Foodland on Sunday and I’m very proud to say that I chose perfectly. The next morning when I cut it open it was beautiful and the best possible texture for slicing. It looks exactly the same as yesterdays just with no tomatoes. My tomato garden died while I was in Anaheim. Mr. Pikko claims, “Hey! I watered them!” but I have my doubts. The plants are all brown and I think they’re unrecoverable. Not too bad though, I must have gotten like 200 tomatoes out of those plants and now I have the pot space to grow edamame!! Weeeee! 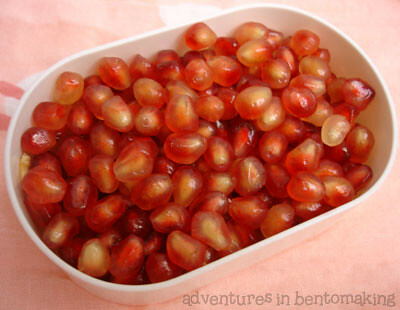 Finally I had pomegranate seeds for dessert. Actually I lied, I had some godly pumpkin pie for dessert. George at work brought by some pieces of this pumpkin pie that his wife made and holy omg it was divine. I asked for the recipe and hopefully I’ll have that in my grubby little pumpkin pie loving hands soon. Yum yum! Combine all ingredients except chicken and oil. Add chicken and marinate overnight or for at least 5 hours. Fry in oil until golden brown. This tastes decent, but I wouldn’t know just how good it is because I made the mistake of frying this while working on the Allakhazam website last night. As a result I have a whole lot of “overly golden brown” mochiko chicken, hahaha! I ate this already and despite my hopes, it still tastes charred. 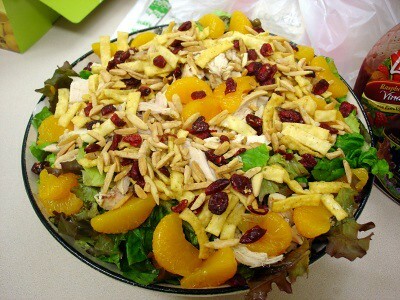 I put in a bit of rice, some carrot and celery sticks, and in the bottom layer I put cheese, grapes, and banana flowers. That’s all I have time for today! 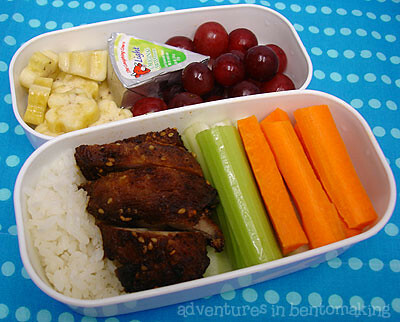 Bento orders were mailed out yesterday! I’ve survived the weekend with my two little tornados. I had to clean the house three times, but what can I do, they’re both in their rascal phase. Saturday I took them to Foodland and while I was buying kim chee crab, spotted a really huge opakapaka for sale. This is hands down my favorite fish to eat so even though it was a whopping $28 I picked it up. Unfortunately it was probably reaching the end of it’s shelf life as on the way home it really stunk the car up something awful. I’m pretty sure truly fresh fish isn’t supposed to stink. Anyway, I steamed it with my Progressive fish steamer and then poured smoking peanut oil on it followed by liberal amounts of soy sauce. I’ve made this once before with a small Tai Snapper and it came out good this time too! The kids ate a lot, especially Buddy, who had like 3 helpings. I took a piece with the skin still on for looks. My grandma would be SO proud of me for serving a dinner with carrot and celery sticks. I don’t remember eating dinner at her house all that often, but one thing that definitely sticks out from all the dinners I do remember is her plate of carrot and celery sticks. It was always there without fail. Funnily enough, many of those dinners I remember as being a bigass steamed fish like this one I cooked. All I needed to give my kids to complete the nostalgic dinner was a really HUGE glass of milk. Sadly, I don’t have the kind of big glass cups she had. Plus cups of milk that huge are just going to end up spilled on the floor or being swished around by Buddy’s milk hungry fingers. Or both! Extreme close-up! The fish tasted really great and healthy, though I still wish it had been fresher. I added to the top some of the fattest green onions I’ve ever seen in my life. In my little fish bottle I have Aloha soy sauce. With fish like mahi or salmon I prefer to eat it with a strong sauce like Kikkoman or Yamasa but light tasting fish like this one just get drowned out so I got for a light taste like Aloha. I count this lunch as 2 points for the rice.